Moleskines make great gifts, they are (in my opinion) too expensive to buy for oneself, but for a friend or loved one I am happy to spend the money. These days moleskine has many different type notebooks and they regularly come out with special-themed editions. But the basic moleskine are still one plain colour. 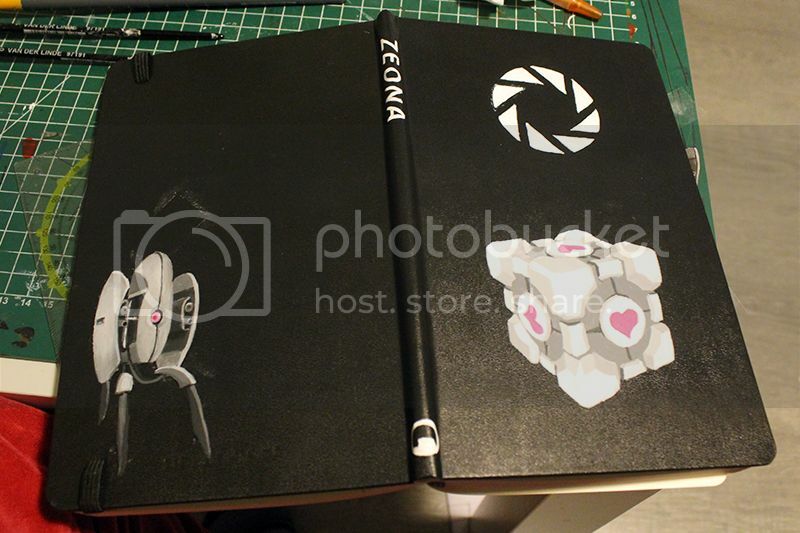 Today I am going to show you how I customized a moleskine for a friend of mine. First, you want to figure out your design. 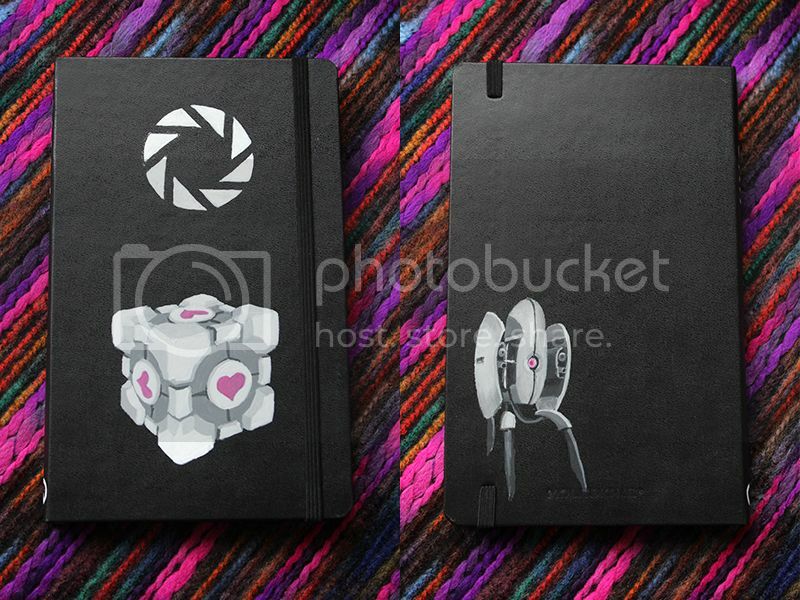 My friend loves portal, so it is going to be portal-themed notebook. I printed out different sized images and cut them out, to decide what would look best. 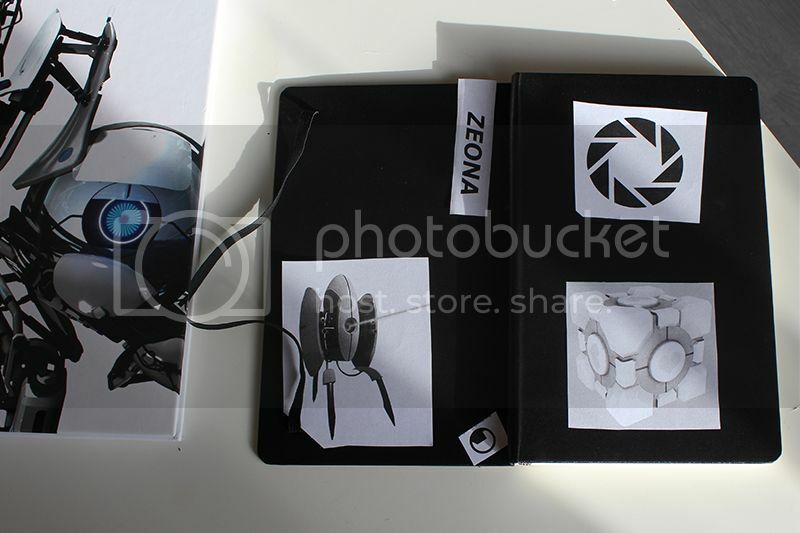 You can also measure the notebook and open a corresponding sized ‘paper’ in Microsoft Word or Adobe Photoshop, but I find working with printed images gives me a better idea what my design actually is going to look like. 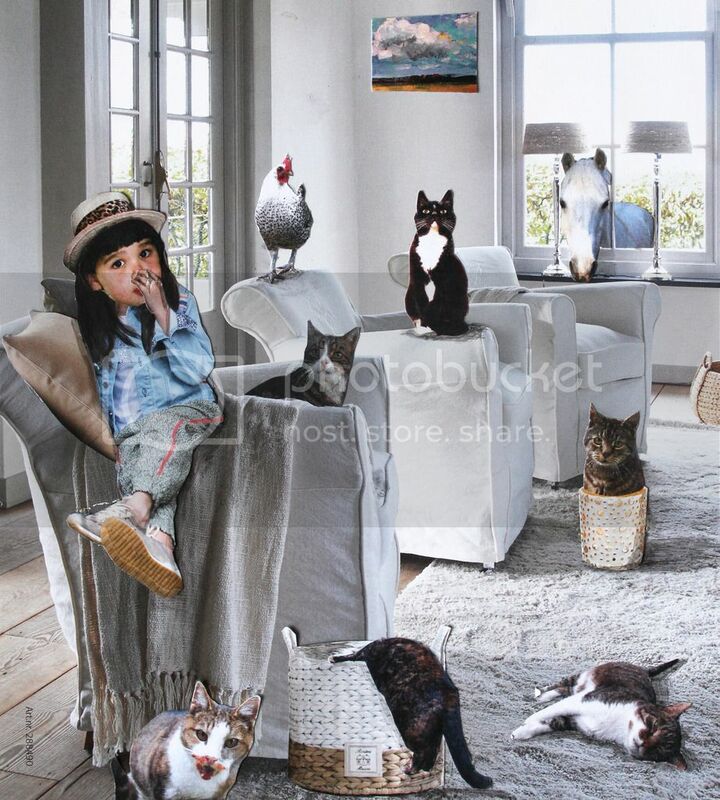 When you are happy with your images, you can cut them out. 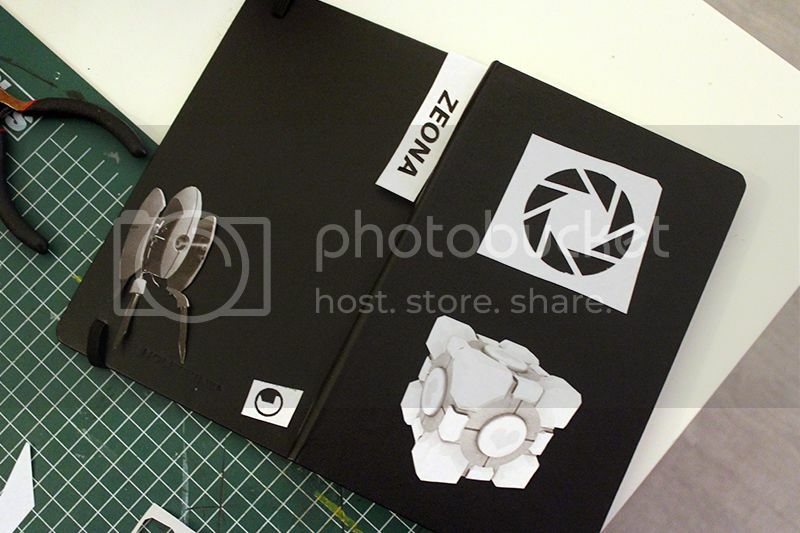 I made a template out of the simpeler images (like the aperture symbol and the text) by cutting out the inner black parts, so I could easily trace them later. 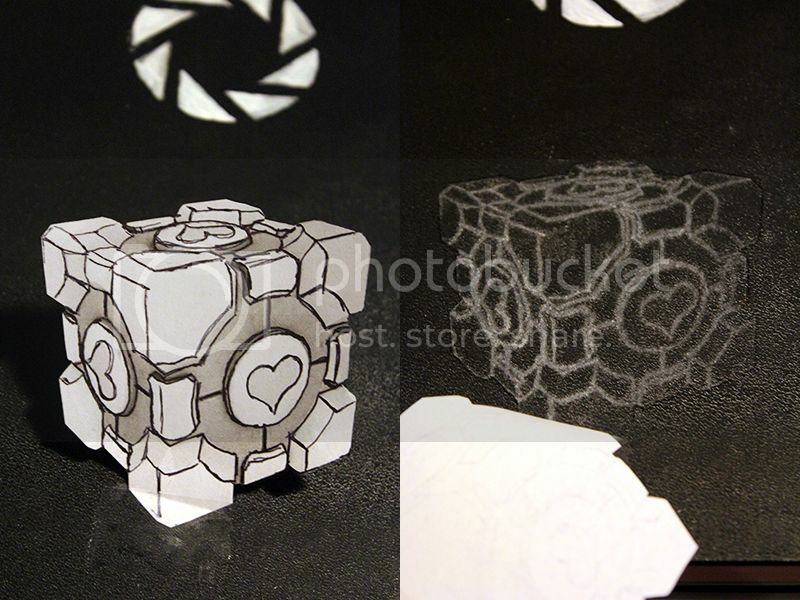 With the more complex images like the companion cube and turret, I just cut out the contours. I then positioned the first image (the aperture symbol) how I wanted and then traced the inside with a micron fineliner, because pencil did not show up and ballpoint pen could not be removed easily. But use whatever works for you. After that I removed the template and filled in the traced parts with acrylic paint. Do not try to stamp your design using the template, the paint will leak underneath the template and will not be easily corrected. I used acrylic paint because it is very durable and water-resistant, it does not take too long to dry and is very affordable. The only downside is that acrylic paint is not very opaque and because it dries fast, you have to get your design on without spilling or making mistakes. This means you need a steady hand and patience, because you will have to apply up to three layers to get full coverage. When it comes to brushes I only used a No.0 and No.1 brush. These are very fine brushes to give me the most detail possible on a moleskine. I used a bigger flat brush to mix the paint on the palette. 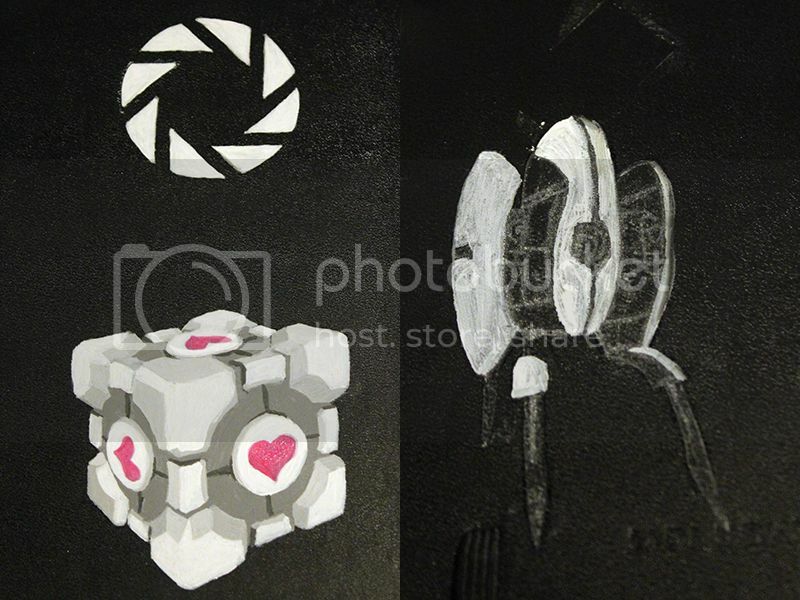 For the companion cube I covered the back of the picture with white conté completely and taped it down, face up, on the notebook. I would suggest that you use regular white chalk instead of conté, but I did not have anything else at the time. I then traced the outside of the image again with the fineliner, and traced the inside of the image using a ballpoint pen and firm pressure. Now the chalked backside acts like carbon paper, making a print of the image onto the notebook. I used the ballpoint pen so I could see easily what I had already traced and what not, so I would not miss any spots. The chalk smudges pretty quickly, so I filled in the most important areas first to get the basic design down. 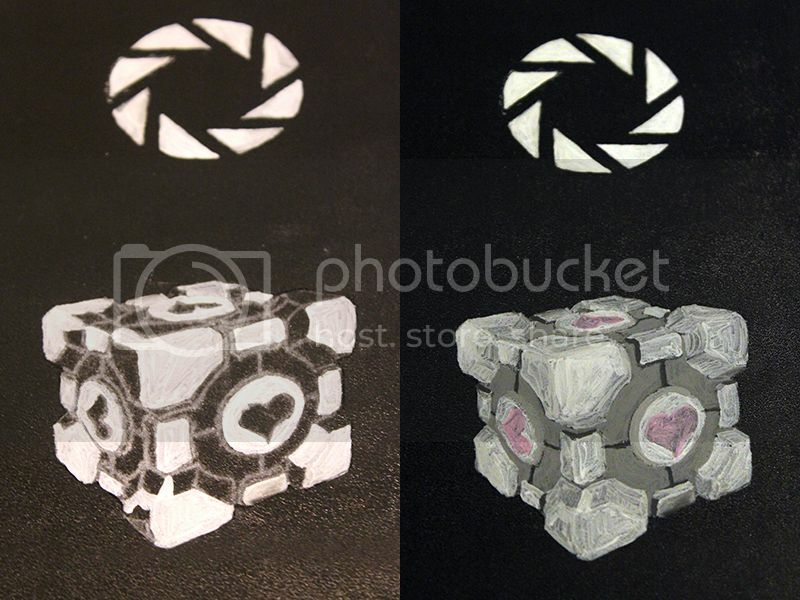 After that I went in and mixed the different greys for the different parts of the cube, and mixed some pink for the hearts to give it all a bit more detail. As you can see the first layer doesn’t cover much at all. There are two reasons for that. First, I thinned down the paint for the first layer quite a bit to be able to work quickly and to get the paint to cover the surface of the notebook properly. Moleskines have a bit of a bumpy surface to them, which can create small black pits in your work if your paint is too thick, this takes away from the detail and makes painting a second layer harder. 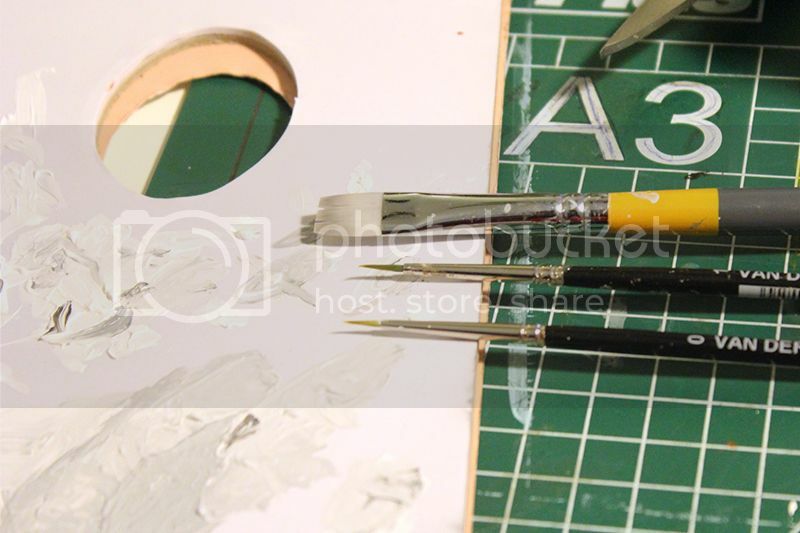 Acrylic paint paints the best over a layer of acrylic paint, so you should always get a thin prep layer down first. Second, like I said before acrylic paint doesn’t go opaque in one stroke, it tends to need two or three layers. Of all the acrylic paint colours, white is the most opaque. I have been working mostly with white paint, but if your design has a different colour, always mix the first layer (or two) with some white paint to give it some coverage and provide a good base for the next layer. You can use cheap paint if you want, but if you do want to invest in quality acrylic paints, get a white with some good high quality pigments. After about three layers my cube was done. Because of the chalk-print technique and the surface of the moleskine it is not as detailed as I might have liked. But unless you have oceans of patience and a very, very steady hand, you probably will not get to the level of detail you desire. But for me, this is good enough. 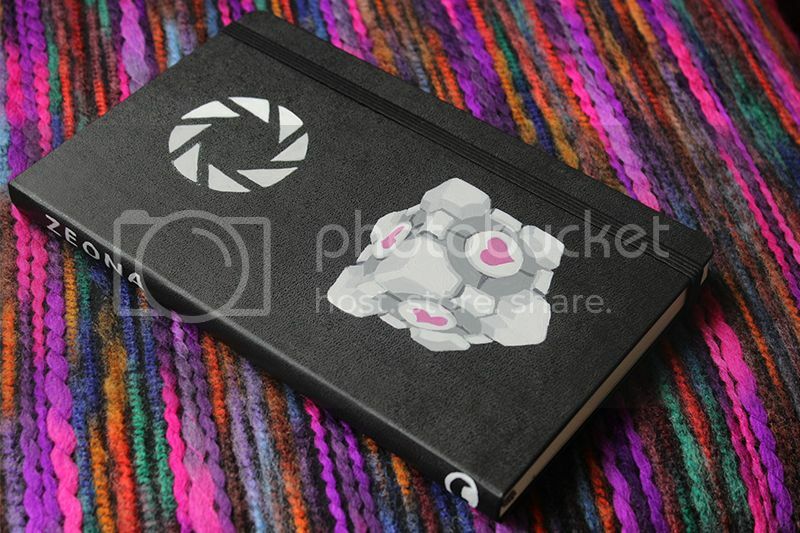 I used the same chalk-print techique on the back of the notebook (after the front had dried of course). 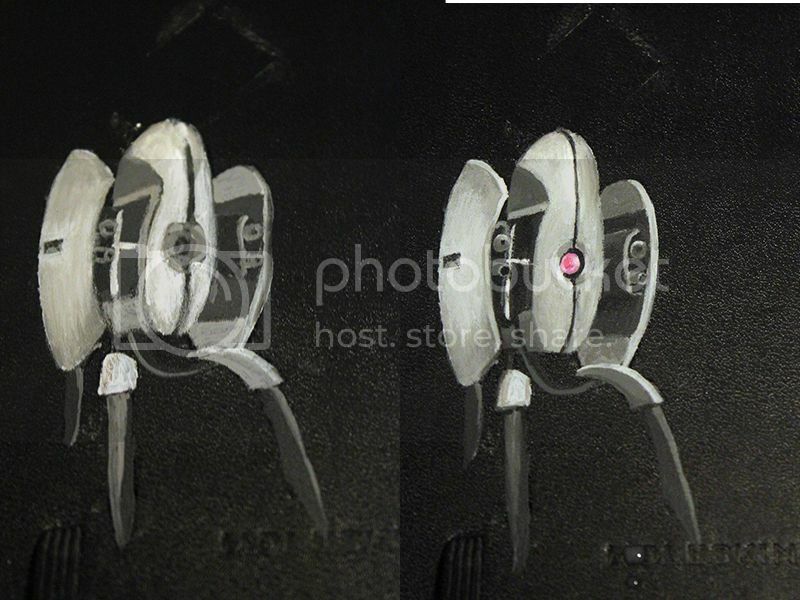 I made the laser of the turret pink instead of red, because, why not? Once you are done and everything is dry you can clean up your notebook. I used a damp cloth and gently patted down on and around the designs I made to remove any chalk residue and leftover fineliner. The fineliner might smear into you work, so that is why I recommend to pat it instead of rub. You can correct any mistakes you made using black acrylic paint if you want to, but I decided not to, because the black paint might reflect the light differently and end up showing up more than the actual mistakes I made. The choice is yours however. After your notebook is done and dry, you have to clean up. I would like to point out that it is not very environment-friendly to wash any leftover paint down the drain. I use disposable palettes that you can tear off and trow away, paint and all. I also wipe my brushes on a napkin before washing them in the sink, to get as little paint as possible into the water. all that is left now is to take some pictures to show of your handiwork and wrap it up! I hope you enjoyed my little project.